Co-location improves access for clients and boosts efficiency and staff morale. TROY, Mich. – When the Michigan Nonprofit Association, Michigan Association of United Ways and the Food Bank Council of Michigan move into new quarters in the state capital this fall (2011), they will be part of a growing trend: nonprofits co-locating under one roof. The nonprofits’ headquarters in Lansing, Mich., will be among more than 250 such centers in the United States and Canada. Although it’s intuitive to think such sharing conserves resources, there has been a dearth of quantifiable evidence on the effectiveness and efficiency of multitenant nonprofit centers. That has changed, thanks to a new assessment by Tides of San Francisco and Tides’ Nonprofit Centers Network (NCN). A leader in developing and modeling innovative practices in nonprofit infrastructure, Tides looked at the environmental and economic benefits of shared facilities. Tides also examined co-location’s impact on organizations’ effectiveness and on communities, said China Brotsky, senior vice president. Arts Court in Ontario is a historic landmark building owned by the local municipality. A hub for Ottawa artists and audiences, Arts Court is home to a consortium of 26 arts and cultural organizations that save thousands of dollars a month in rent by sharing office and rehearsal space. The Alliance Center in Denver is home to 27 nonprofits. Half of those tenants work in the environmental field. The center and its tenants have helped pass more than 100 pieces of sustainability-related state legislation in just two years. Children & Family Services Center in Charlotte, N.C., is a nonprofit center with 11 organizations co-located to better serve the children and families. In addition to coordinating services, the center has expanded into shared back-office services including information technology, human resources and finance staff. The NCN surveyed 150 shared nonprofit centers, interviewed the leaders of 15, held focus groups, wrote case studies and surveyed tenants of shared centers. 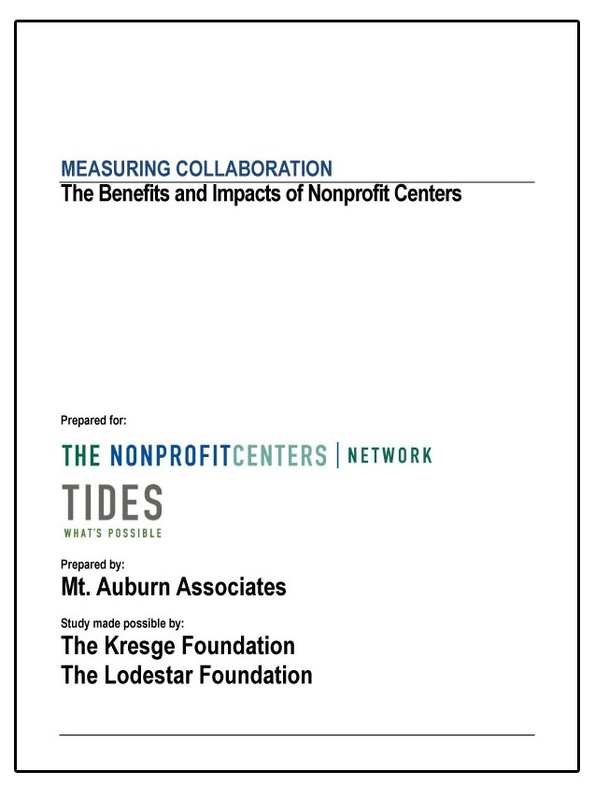 Of the nonprofits surveyed, 86 percent said co-location had increased their effectiveness and efficiency, 68 percent said it enhanced their ability to achieve their mission, 65 percent reported increased staff morale, 49 percent had more revenue and 80 percent said clients had an easier time accessing services, Brotsky reported. “NCN is using the data to identify the key characteristics of high-performing collaborative centers and create benchmarks for existing and proposed centers,” she said. “We’ve also created a toolkit to help nonprofit centers be more concrete about goals, assess their impact on the community and provide a structured way to obtain tenants’ feedback,” Brotsky said. The Kresge Foundation’s Human Services Program awarded a $150,000 grant to support the work. The toolkit, study findings and training resources is available on the Kresge and NCN websites. Armed with NCN’s findings, Walker predicted the sector will be able to demonstrate the economic and community benefits of investments in a single facility that serves multiple organizations and missions.